June 19, 2014 - Like us now! There are currently more than 25 incubators and accelerators running in Pakistan. These incubators are now producing a large number of startups every year. TechJuice team recently met a few of these graduates and one of the major problems that they faced was lack of office space after completing their incubation period. At the end of the graduation period, there are very few startups that manage to make their startup into a self-sustainable business. Most graduates lack the financial stability to get an office space, something which becomes essential for a startup as it starts to grow. This problem can be readily remedied by utilizing co-working spaces, a place where individuals work independently while sharing the office and the facilities. Startups can then interact and network with other startups, entrepreneurs and freelancers as well as get access to VCs, angels investors and mentors. Co-working spaces are also ideal for networking and learning. Freelancers who usually work from home can use these co-working spaces as their teams grow. 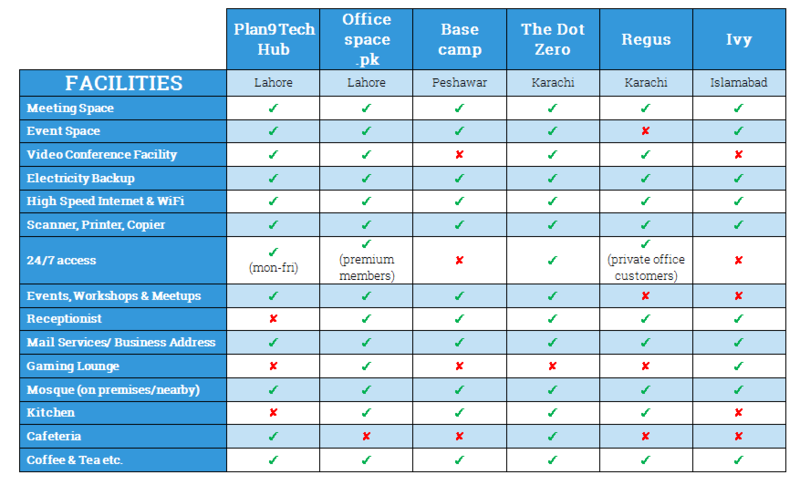 TechJuice has come up with a list of some of the best co-working spaces in Pakistan and compared them on the basis of the facilities and packages they offer. Take a look at the following tables for a comparative summary and then read on to find out more about these co-working spaces. Plan9’s TechHub provides young freelancers a state of the art working space, empowers them to channelize their skills & potential and enables them to contribute towards the national economy. 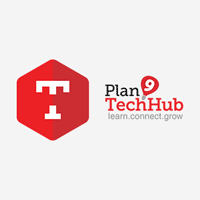 The Plan9 TechHub began its operations earlier this year in February and is giving out working places for freelancers on a quarterly basis. Location: Building # 86, Cavalry Ground, Lahore Cantt. If you’re a team or an individual that needs an office space in Lahore, Officespace.pk is the place to go to. The facilities include fast internet, conference rooms and more. Officespace.pk offers standard workplace amenities in their building along with its own unique amenities like Xbox lounge, relaxation room and meeting room. 24/7 access is also available for premium members. Location: Arbab Tower, Nasir Bagh Road, Peshawar. Basecamp is by far the only co-working platform situated in KPK. It is a unique co-working and community space designed for Pakistani startups. Basecamp provides its residents an environment to network with entrepreneurs, experts and investors. Basecamp doesn’t offer a 24/7 access yet but sources tell us that a plan is in the pipeline. If you live in the North Western parts of Pakistan, and are looking for a co-working space, Basecamp is one of the best options for you. Location: 14th Floor, Dilkusha Forum, Main Tariq Road, Karachi. If you are a Karachi-based individual or team, are doing innovative work and are also focusing on building a long term company, then you should definitely look into DotZero’s packages for getting yourself a co-working place. 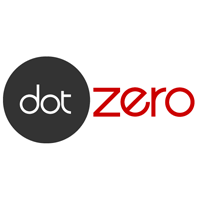 DotZero has a variety of packages targeted towards different types of customers and their customized needs. The company also encourages people who are working on their university Final Year Projects (FYP)and are looking to convert their FYP into a commercial entity. – BRR Towers, 13th and 14th Floor, I.I Chundrigar Road, Karachi. – 1/F Bahria Complex III, MT Khan Road, Karachi. – 7th Floor, Executive Towers Dolmen Mall, Clifton, Karachi. Regus is the world’s largest provider of flexible work-spaces with 1,800 centers in 600 cities from all over the world. In Pakistan, it has a few centers in Karachi and is planning to extend its services to Islamabad and Lahore shortly. The company claims that it meets the needs of large corporates and small businesses alike. Regus offers a variety of different packages to cater the needs of everyone from a home-based business owner to SMEs and even large corporate clients. The company offers different packages for different businesses. If you’re interested in working with Regus and need exact information about their packages, you can always visit them (physically or online) or call them up. Location: 155 Service Road North, STP 3, Sector I-9/3, Islamabad. 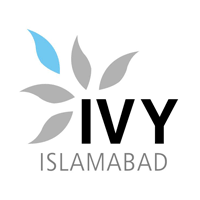 IVY is one of the first work-spaces for tech entrepreneurs and independent professionals in Islamabad to carry out their business activities in an office like environment. IVY offers a well-equipped space where people can be more productive and potentially more prosperous. It is inherently more economically sustainable facility for those freelancers and entrepreneurs who are working at home and want to take their business to next level. This space provider also offers ready-to-move work environment with useful resources to its residents. IVY is a relatively new setup and doesn’t have as many individuals and teams working there yet but the initiative looks promising. The need for more co-working spaces still exists. Perhaps this is the reason why new incubators are also trying to build office spaces which the graduates can use after the incubation period ends. LCE’s Plug’n’Play centers may contribute to the cause but there is still a need for more spaces where new startups can get access to the desired facilities to expand their businesses.